If you cheat, may you cheat death. If you steal, may you steal a woman's heart. If you fight, may you fight for a brother. And if you drink, may you drink with me!" What's any occasion without some good liquid cheer and conversation lubricant to liven things up? Whether you are a restaurant or liquor retailer looking for someone to host a special event, or if you just want to throw a party for your poker and cigar club that won't be easily forgotten, then Contact me for information on whisky tastings and paired dinners. Scotch presentations even come complete with kilt! Look good? 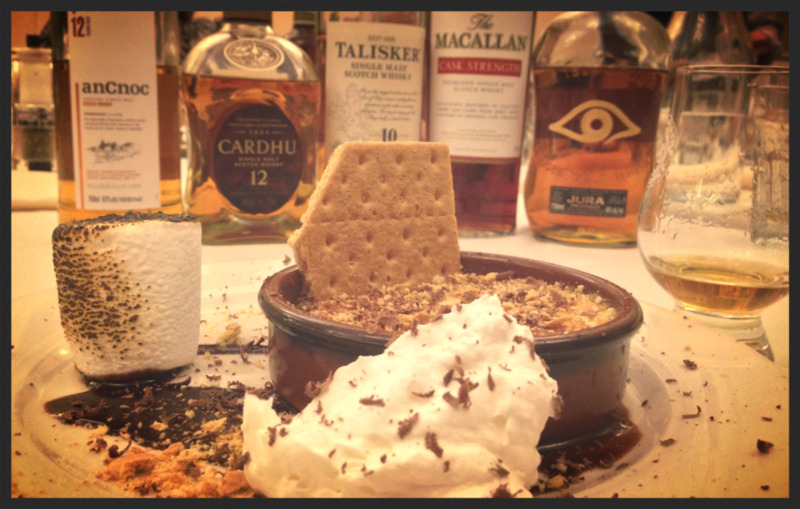 Above is a deconstructed s'more crème brûlée prepared by Bradford Kline paired with a glass of Jura Prophecy. This was the final plate to a 5 course Fall whisky dinner in October 2013.